Surf is the name of a brand of laundry detergent made by Unilever and sold in India, Ireland, South Africa and many other countries. In the United States the Surf product line is owned by Sun Products. 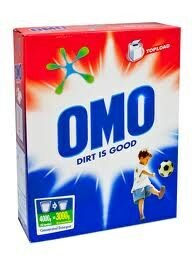 The brand Omo was used when it was introduced in Australia and New Zealand but in Australia and South Africa, Surf as well as Omo are sold and they are both top- selling laundry detergents in Australia. Surf was introduced in 1959 after Rinso, formerly Lever's best selling detergent brand, had declined in both sales and market share. Formulations of the detergent and the market segment targeted vary by region; in some countries Unilever also markets Persil detergent (but in others Persil is a Henkel brand).